On 6th August, Justin Sun, the Co-Founder of Tron, informed its users that Tron was the most searched cryptocurrency on Twitter for a one hour time period on 5th August. The figures showed that the TRX token was mentioned 1,611 times whereas Bitcoin was mentioned a close 1,454 times on 5th August. This disparity showed that despite not being as mainstream as Bitcoin, Tron has managed to garner quite the fan following. The company has given credits for the massive spike in usage to all the developments that were implemented by the foundation over the previous weeks, which included the launch of the Tron Virtual Machine. Tron has also stated that the newly updated frameworks of the network will be compatible with the Virtual Machine and will support the recovery and snapshot options. The Foundation claimed that the launch of the Tron Virtual Machine will enable Tron to surpass Ethereum in terms of daily transactions, which will enable it to become the most influential public blockchain in the world. The Tron Foundation has also stated that Stock.Exchange has completed the TRX token migration and swap and has also begun deposits and withdrawals. 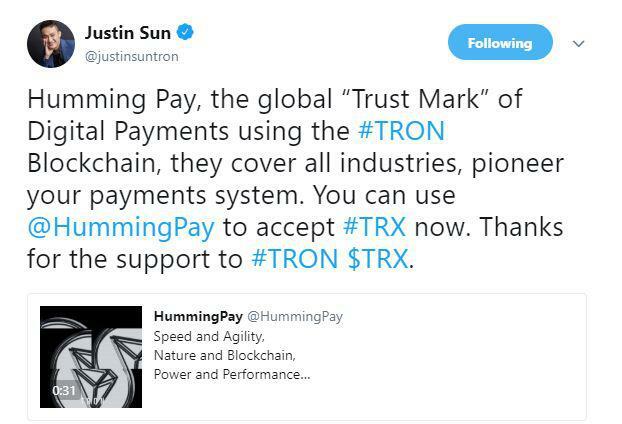 As a previous update on 5th August, Justin Sun also announced that TRX can be traded on Humming Pay, a blockchain-based payments solution. This will allow users to take advantage of the widespread influence of the cryptocurrency market. Humming Pay also stated that they cater to all people, whether a small business, early cryptocurrency explorer or a large corporation, allowing the inclusion of a larger user base. They have also claimed that the company will work with the Tron Foundation to take the organization’s vision and goals forward. The benefits of being a Humming Pay partner are its fast transaction speeds, payments not controlled by banks, and the cheaper fees compared to usual payment methods, claims the company. One of the most important aspects, as per the company, is the focus of both the companies on security protocols and payment protection methods. Humming Pay uses the TRON Network for traffic and distribution with the main aim of making transactions faster and more seamless. The post Tron [TRX] tops cryptocurrency search charts, company claims it is en route achieving ‘mainstream’ status appeared first on AMBCrypto.